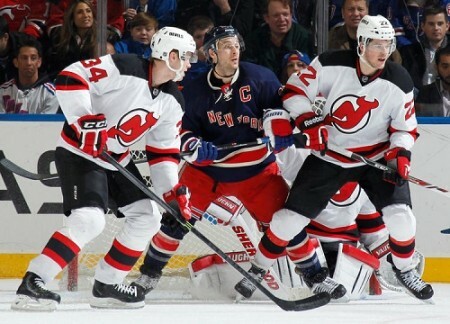 The Devils 4-3 overtime win over the New York Rangers on Sunday perfectly summarized their 2013-14 season thus far. New Jersey came back from a two-goal deficit by scoring three consecutive goals, but then committed a silly delay of game penalty late in the third period and the Rangers capitalized, scoring with 22 seconds left to send the game into overtime. Then, just a minute and fifteen seconds into extra time, rookie defenseman Eric Gelinas won the game for New Jersey with a rocket of a slap shot that New York goalie Henrik Lundqvist – screened by Steve Bernier – couldn’t stop. The ups and downs for the Devils carry on. New York scored early in the first after defenseman Peter Harrold – playing in place of Marek Zidlicky, who sat out with an upper body injury – pinched up on a play in the Rangers zone; the puck bounced past him to Brad Richards, who skated the length of the ice and ripped a shot past Martin Brodeur’s shoulder. Then, less than a minute into the second period, Mats Zuccarello buried a fatty rebound that Brodeur gave up off of Ryan Callahan’s shot. I believe it was David Clarkson that Devils color announcer Chico Resch used to call the “sparkplug,” but it seems as if Cam Janssen has inherited that title this season, as he provided the momentum swing New Jersey needed to turn this game around. Brodeur cleared a pass two-thirds of the way up the ice to Tim Sestito, whose shot was turned aside by Lundqvist, directly into the skates of Janssen. The puck deflected off Janssen’s left skate as he was already in a stopping motion and floated into the back of the net. Was it a crap goal? Sure. Was it the right call by the referees? Absolutely. The rule states that the puck can be directed by a skate as long as there is no distinct kicking motion; Janssen clearly was leaning back as he tried to stop his motion, and therefore couldn’t have kicked the puck even if he’d tried. It wasn’t pretty, but it doesn’t have to be—a goal is a goal, regardless of how it looks. The Devils tied the game on a goal from Travis Zajac – yet again assisted by Jaromir Jagr and Dainius Zuburs – just under six minutes into the third period, and Michael Ryder’s third goal in four games gave the Devils the lead as he made a Claude Lemieux-esque move to beat John Moore and then fired his shot past Lundqvist’s glove. New Jersey killed two penalties earlier on in the third period, so when Zajac’s clearing attempt went into the stands, there still was some hope that the Rangers wouldn’t be able to capitalize. However, New York pulled Lundqvist to get the extra skater on the ice, and their 6-on-4 proved to be too much for New Jersey’s kill efforts as Chris Kreider scooped the rebounded shot from Ryan McDonagh – which, incidentally, was stopped by Callahan’s gut – past Brodeur. The mistake at an inopportune point in the game seemed to deflate the Devils as the game required extra time to determine the winner. NEW YORK, NY – DECEMBER 07: Eric Gelinas #22 of the New Jersey Devils celebrates after an overtime goal against the New York Rangers at Madison Square Garden on December 7, 2013 in New York City. Turn about’s fair play, though: with just 1:02 elapsed in OT, Callahan committed a high sticking penalty, drawing blood from Andy Greene’s face as well as an additional two minutes of penalty time. Thirteen seconds later, Gelinas ended the game with his third goal of the season and the Devils earned a hard-fought two points for the first time in a week. It bodes well for New Jersey that they found a way to win despite giving up ample opportunities to the Rangers to close things out. The Devils are 3-0 against the Rangers this year, and they’ll play twice more, including the Stadium Series game on Jan. 26. The ups and downs of this game, though, are in line with how this season has been for New Jersey. It’s been a season of streaks for the Devils, but they have found a way to stay reasonably close to breaking into the top half of the Eastern Conference, as their 30 points are just one point behind the Carolina Hurricanes and the Rangers. Minus: New Jersey went 1-3 last week and earned only three points out of a possible eight. Math is easy; the Devils spot in the standings could have been higher entering this week. They lost two tough games in the home-and-home against the Canadiens despite playing two solid games, then got hosed by a wrong call of illegal play by the goalie in the loss to the Detroit Red Wings when Cory Schneider played the puck inside the trapezoid but was deemed to have played it outside.